This beautifully-shot Australian documentary attempts to explore why humanity has chosen over the last century or so to start climbing the tallest mountains in the world. Or at least this appears to be the only tangible theme to “Mountain” other than it being a work of eye candy that belongs on the National Geographic Channel. 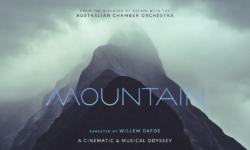 Director Jennifer Peedom’s (“Sherpa”) film doesn’t begin like documentary as we watch, in black and white, members of the Australian Chamber Orchestra tuning up their instruments and Willem Dafoe prepping before a microphone. Then suddenly we are thrust into some of the most wonderful cinematography you will ever see as we fly like Superman across breathtaking mountaintops. From grandiose passages of British writer Robert Macfarlane’s 2003 book “Mountains of the Mind,” Dafoe speculates about what strange force from within the mountains changed humanity from fearing them to trying to conquer them. All the while we continue to see one shot of a mountain after another, often with a mountaineer dressed in a red or other brightly colored shirt to stand out in contrast to the natural background. There is some expected exposition of Mt. Everest, the king of mountains, but generally what see are nameless geographical features from all over the world. It’s not just climbers, though, that puts us on the edge of our seats as they put their lives on the line in the name of trying to feel alive. There are skiers and snowboarders dropped from helicopters trying to stay ahead of avalanches they themselves create; tightrope walkers balancing themselves across gaping canyons; bicyclists jumping off cliffs; and let us not forget those that glide through the air at high rates of speed like flying squirrels. To Peedom’s credit, we do see some of the negative consequences these thrill seekers inflict upon themselves. It’s a challenge to label “Mountain” as a documentary because there isn’t much to it that provokes conversation or opinions about the subject matter after the credits start to roll. Nor are we educated about the subject of mountains other than they are beautiful and some people like to risk their lives for them. The music is wonderfully played, especially the “Winter” portion of Italian composer Antonio Vivaldi’s masterful “Four Seasons.” Dafoe’s narration is okay, but Macfarlane’s descriptions are borderline ridiculous with their grandiosity. In the end, “Mountain” is more style than substance. It’s a challenge to label “Mountain” as a documentary because there isn’t much to it that provokes conversation or opinions about the subject matter after the credits start to roll.